Survival tales are great material for cinema. A courier service employee marooned on an uninhabited island after a plane crash, a truck driver consigned to a coffin while alive, an adventurer trapped by a boulder in a deserted canyon – each of their stories has been turned into a compelling film, in a genre that has often paid solid box-office dividends worldwide. 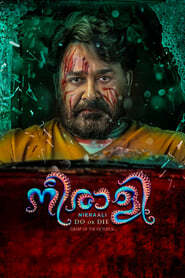 Following in the footsteps of the likes of Cast Away (US/2000), Buried (Spain/2010) and 127 Hours (UK-US/2010) comes Malayalam cinema’s Neerali. Mohanlal here plays Sunny George, an incorrigible womaniser who is juggling a couple of affairs when his pregnant wife goes into labour in another city. To reach Molykkutty (Nadhiya Moidu) before the birth of their twins, he takes a lift from Veerappan (Suraj Venjaramoodu) who is headed in the same direction in a sturdy pick-up truck. Somewhere along the way Sunny wakes up bleeding as their vehicle sits precariously balanced at the edge of a mountainside with a sheer drop of hundreds, if not a few thousand, feet below them.